You have to capture the whole experience through Twitter and Facebook, sharing your experience with the world. No seriously, what's the catch? Well it's certainly not that. The catch is that the job has to be won. 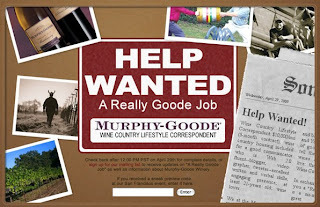 Murphy-Goode Winery is offering all this to one lucky person according to a San Francisco blog. Kinda sounds a lot like the recent Australian Tourist Board promotion! So what do you have to do? Well first get yourself over to http://www.AReallyGoodeJob.com, fill out the application and submit a one-minute video showing off yourself and your special skills. Seriously, I really think this is an Australian idea! Ok, so this really is like the Best Job in the World, but is that a bad thing? No, not in my opinion. Lets face it, the campaign worked. The response, globally, was huge and it drove massive ammounts of traffic and publicity. So the real question is, when will it happen here? Does an Irish company have the bottle to do it?